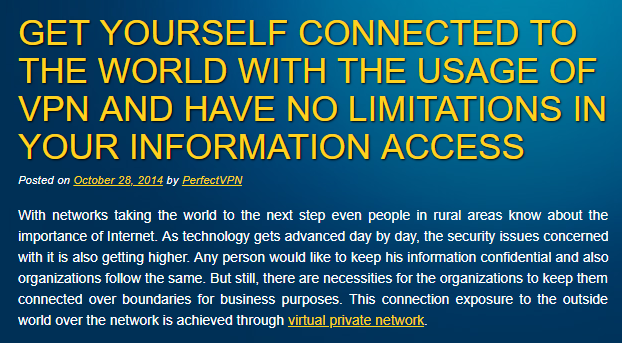 With a very rudimentary looking website, PerfectVPN doesn’t really fit into the modern VPN industry standards. These days, all the bigger providers have flashy websites, an exhaustive list of client apps, features galore and even more. Their main aim is to be as appealing and as facilitative as they can be to the modern user. And in such a competitive environment, it is incredibly hard for providers like PerfectVPN to carve out any sort of substantial niche or consumer segment for themselves. This also explains its obscurity and absence from all major Best VPN discussions. A quick Google search for the search term “Perfect VPN Review”, you wouldn’t find any relevant results, but rather, you will stumble reviews for another VPN called Perfect-Privacy VPN in its wake. So today, I set towards filling this gap and pulling up a major and much needed review on PerfectVPN and its different feature and service aspects. This review will be brief as this provider doesn’t have the usual features that the more “Conventional” VPN providers do, but be rest assured as I won’t leave any facet of the service uncovered. PerfectVPN is now more than a decade old in this industry as its inception date of 2008 indicates. But despite that, they are still, at least a decade behind the current industry standards. They haven’t mentioned anywhere as to where they are located, which is an extremely important thing to reveal because of all the complex data retention laws around the world. Users need to know whether their data is safe with the provider or not. The website looks like something straight out of the Windows 98 era, with no major effort showing off the provider to bring the site in line with UI & UX expectations of the current crop of customers. Even the blog hasn’t been updated since 2014, which is a good half a decade ago. So if you are one who likes flashy and easy to use VPN services, PerfectVPN isn’t one for you. But then who is it for actually? Well, it mainly for those who are looking for a stable, reliable provider that can offer a VPN service for a not-too-high subscription fee. If there is one thing a VPN seriously cannot afford to compromise on, its stability and reliability and PerfectVPN scores some big points in this review just because of fitting this requisite to the T.
Having tried out this service over a span of a week, never once did the connection got dropped, which is an exceedingly impressive feat on part of the service. One big problem that plagues many a small provider is that their subscriptions are often priced in the same bracket as the market leaders i.e. those service with much more features. This makes it a no-brainer for many to not go for such services or even try them out because really, why would you waste your money on getting something that offers so less when you can get more for the same? But PerfectVPN doesn’t straddle along the same lines as its subscription plans are extremely affordable. Yes, the plans are a bit complicated to understand, but some focused reading and you know what exactly you are getting. This plan is limited only by the amount of bandwidth you can consume i.e. 100 GB at max. Getting the yearly subscription to this will make you cost the service at just $1.58/month. The best plan of the lot, PerfectVPN is offering you the chance to use your own Private IP at just $45 billed once for a full 12 months without any limits on bandwidth usage. I recommend this plan to the best for those who are either trying to access the free internet in a restrictive country like Iran or Saudi Arabia or to those who like to go around firewalls in their offices. In this plan, you can get access to all the best things PerfectVPN has to offer like unlimited bandwidth, 5 Multi-logins and access to all servers at just $45/year billed once. If you want to unblock sites in just the US and the UK, then this plan is for you. But I wouldn’t advise general users to go for this as this plan’s sphere is quite restrictive. Nowadays, you can easily secure subscription to VPNs that offer more than 1000 servers worldwide in as much as 50-100 locations on average at less than $4/month. So it’s no surprise that PerfectVPN can’t be compared to them with its small server park comprising of just 24 locations. But what it lacks for in sheer volume, it makes up for it in diversity. PerfectVPN not just offers servers in the conventional European and American Regions but it also boasts of fast, secure servers in places like the Far East and Middle East (Turkey), allowing people living in those regions a facility to connect to servers nearby and experience optimized performance. You can pay for the plan through the regular options like your credit/debit card and Paypal and through some unconventional options also like Perfect Money, OKPay, Payza. This is good as there are a lot of people who are not comfortable sharing their credit card details online and these extra options can give them a buffer to work with certainly. But apart from all of this, PerfectVPN should add an anonymous payment option like Bitcoin to its list in order to make it much more safer for users to pay for the plans. I am a big fan of zero-commitment free trials and when I say Free trials, I mean Free trials and not refund periods (there is a big difference between the two). PerfectVPN offers a 1 hour free trial of its service in which you can test out all of its features and servers, which is an impressive feat on part of the provider but still, I would have liked it more if the period was of at least 12 hours at a minimum. 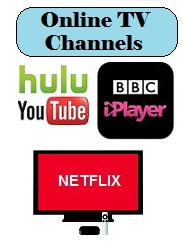 Getting past geo-restrictions on streaming sites these days is not an easy task at all and that’s because modern day geo-restrictions are quite sophisticated in sniffing VPN connections out unlike the lax firewalls of yesteryears. And amidst all of that, it’s no mean feat that I managed to unblock BBC iPlayer through PerfectVPN. Many Providers who can unblock Netflix US are often times not capable enough to replicate the feat on the iPlayer, so PerfectVPN gets my thumbs up in that category. 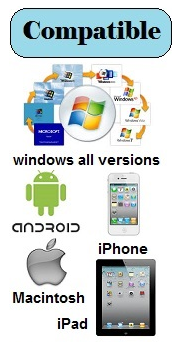 There are absolutely no client apps available which can make it extremely difficult for newbies to set up the service. PerfectVPN does offer compatibility with Windows, Macs, iOS, and Androids but you will have to do it manually, which is a bummer as it’s not just time consuming to do that but also cumbersome. Netflix doesn’t get unblocked with PerfectVPN. I kept encountering the dreaded proxy error message over and over again. I was left impressed when the provider managed to unblock the iPlayer but this almost leveled out the advantage the provider offers in the unblocking domain. PerfectVPN doesn’t have OpenVPN protocol, neither, does it offer any info on its encryption standards, making us doubt its security infrastructure. 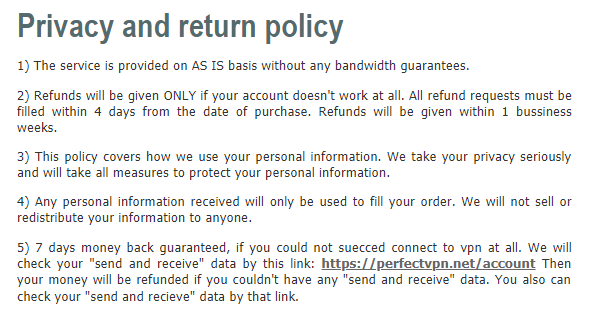 The provider didn’t have any DNS or WebRTC leaks, so I can be assured that its safe to use it, but divulging info about encryption and offering OpenVPN is necessary for a user to be absolutely sure about the security of the VPN it’s subscribing to. 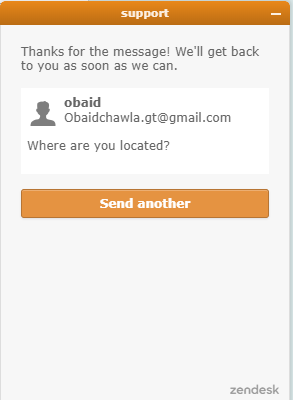 The provider does offer live chat support, but it seems that it has its working hours. The chat support was offline when I posed them with a question and I haven’t still secured the reply. Live chat means that you are always available for answering user queries and PerfectVPN’s support certainly doesn’t live up to that billing. There are many services that are better than this provider whether you compare them with features on offer, servers, and locations available and many other aspects that make up a modern day VPN service. PerfectVPN is far from a perfect VPN service but its Dedicated IP plan for US and UK is what I will recommend stringently for as its performance was immaculate on that front. But apart from that, this provider needs a lot of work and improvement to come close to the more established VPNs of this industry and compete with them on an equal pedestal.